German writer; born at Leipsic Jan. 24, 1868. He studied at the universities of Leipsic and Berlin, and in England, receiving the degree of doctor of philosophy in 1889. He is the author of most of the articles pertaining to literature in the fourteenth edition of Brockhaus' "Konversations Lexikon." He became secretary of the German National Museum at Nuremberg in 1892. In 1893 he resigned this position to become docent at the Technical High School of Stuttgart (1893-1895). At present (1903) he is instructor in Munich. 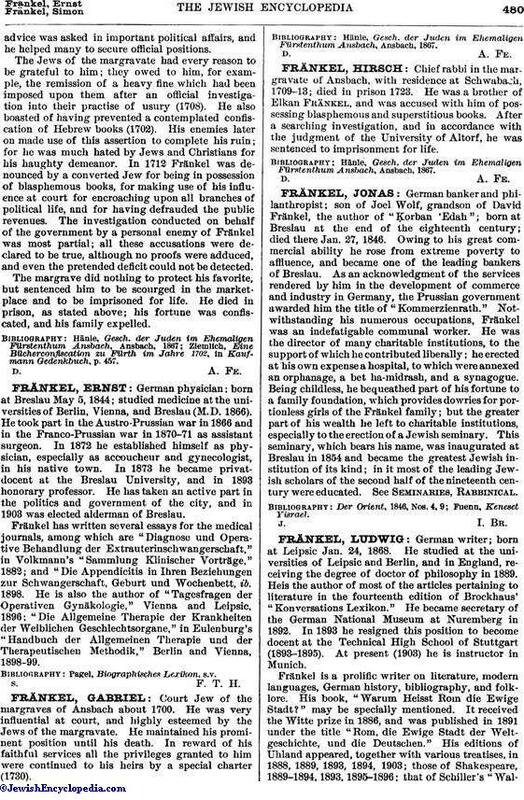 Fränkel is a prolific writer on literature, modern languages, German history, bibliography, and folk-lore. His book, "Warum Heisst Rom die Ewige Stadt?" may be specially mentioned. It received the Witte prize in 1886, and was published in 1891 under the title "Rom, die Ewige Stadt der Weltgeschichte, und die Deutschen." His editions of Uhland appeared, together with various treatises, in 1888, 1889, 1893, 1894, 1903; those of Shakespeare, 1889-1894, 1893, 1895-1896; that of Schiller's "Wallenstein,"1902; a German edition of Manzoni, "I Promessi Sposi," 1893; and of Bojardo, "Orlando Inamorato," 1895. 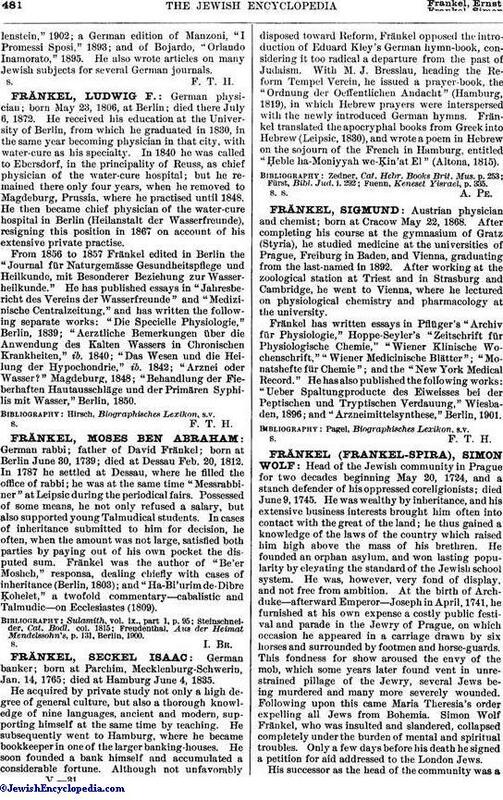 He also wrote articles on many Jewish subjects for several German journals.